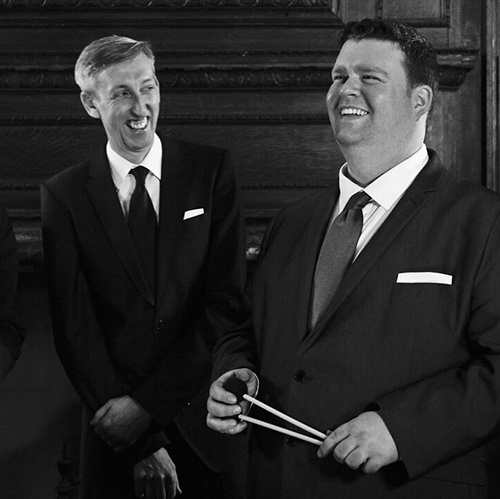 UK vibraphonist Nat Steele, in collaboration with visiting NYC tenor saxophonist Grant Stewart, plays his take on the classic 1950s Prestige album "Sonny Rollins with the Modern Jazz Quartet" with Gabriel Latchin, Dario di Lecce and Steve Brown. Vibraphonist Nat Steele released his debut album, "Portrait of the MJQ" in 2017 to critical acclaim, being awarded Jazz Album of the Month in BBC Music Magazine and winning rave reviews from the jazz press and national papers. Since his arrival on the scene, Nat has quickly gained a reputation as a talented musician to watch out for, described by Clark Tracey as "one of the best vibes players this country has ever produced." Following in the style of Milt Jackson and Cal Tjader, Nat takes a two mallet approach to improvisation, focusing on melodic interpretation and a great swing feel. The MJQ gained attention for bringing jazz out of the club and into the concert hall in the 1950s, and for being an early pioneer of the “third stream” fusion, combining classical compositional techniques with jazz improvisation. It featured the contrasting talents of its musical director and pianist, John Lewis, who played with an understated control, with the fiery, boppish stylings of vibes pioneer Milt Jackson. Pianist Gabriel Latchin is constantly in demand as a side man. Most recently he’s gained attention for his role in performing with Christian McBride and Renee Fleming at Wigmore Hall. Bassist Dario di Lecce was raised in Bari, Italy, where he began studying double bass with Maestro Giorgio Vendola. He has performed around Europe and the US, and in 2012 he moved to London where he is currently working with some of the most important musicians the British jazz scene. Multi award-winning drummer Steve Brown is first call sideman with many of the capital's finest musicians, including engagements with Harry 'Sweets' Edison and Conte Candoli, and is a regular in Scott Hamilton's UK quartet.